My husband Ralph and I were at the beach recently. It was early in the morning and we had the ocean mostly to ourselves. 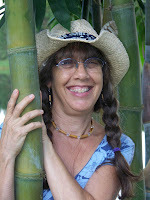 Only a few other early risers were wandering the shoreline and one of them, a woman, was bent over what looked like some sort of large, dark colored, rounded creature. Curious about what she had found we hurried along to check it out. During the years we lived on Cape Cod, MA, horseshoe crabs were an ubiquitous feature of bayside beaches. 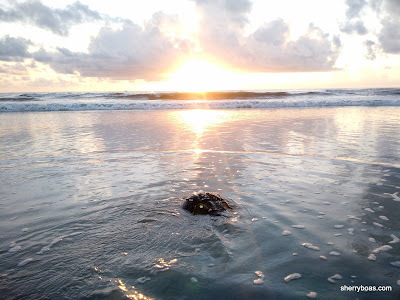 However, until that morning in New Smyrna Beach, I had never seen one in Florida, which is surprising since the North American habitat for these saltwater swimmers includes the Gulf and Atlantic coasts from Maine to Mexico. 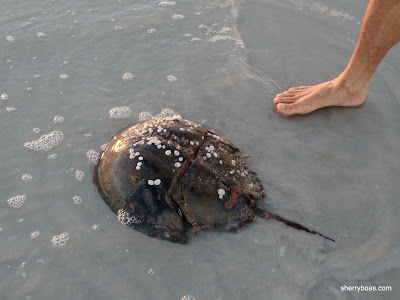 Despite its name, the horseshoe crab, Limulus polyphemus, is not actually a crab at all. Instead of being a crustacean, this hard-shelled arthropod is categorized as a Merostomata, the sole member of a classification that means ‘legs attached to mouth.’ It is more closely related to scorpions, spiders and ticks than it is to lobsters, shrimp or crayfish. A horseshoe crab has three body parts, ten legs, two feeder pincers, nine eyes and six pairs of flap-like gills that enable it to breathe underwater. 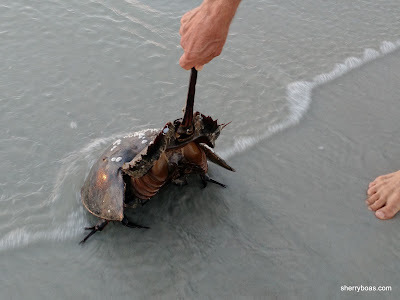 With its helmet-shaped shell and long spiked tail, it’s easy to see how an uninformed beachgoer like the woman we were standing next to might find this unusual looking sea creature potentially threatening or at least intimidating. 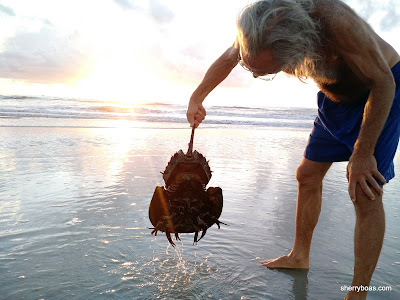 The horseshoe crab's hard, spiked tail is not dangerous. 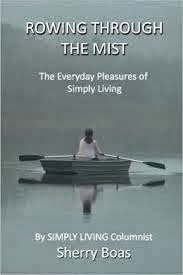 It is used like a rudder when swimming and as a means to right itself when flipped over. However, there is nothing dangerous about horseshoe crabs. They don’t bite, stab or sting people. Their purpose in life centers on finding food and reproducing. Foods eaten by these nocturnal hunters include aquatic worms, algae, mussels and clams with the occasional meal of carrion for culinary diversity. When prey is located, a horseshoe crab uses its legs to dig through sand for the catch. Once secured, the predator employs its pincers to squeeze and mash prey before stuffing it into its mouth, which is located on its flat underside. The hard exoskeleton of the living fossil Ralph and I encountered was covered with barnacles and seaweed. We estimated the size of its carapace to be about 16 inches long and around 12 inches wide with a 7 or 8-inch long tail. Horseshoe crabs can live for up to 40 years and judging from the size of the one we saw, it must have been an elder statesman of the horseshoe crab clan. 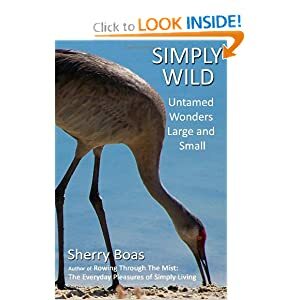 During its early years, it managed to avoid becoming food for a wide variety of shorebirds and as it matured it evaded capture by sharks, sea turtles and humans, who harvest horseshoe crabs for bait as well as for medical purposes. 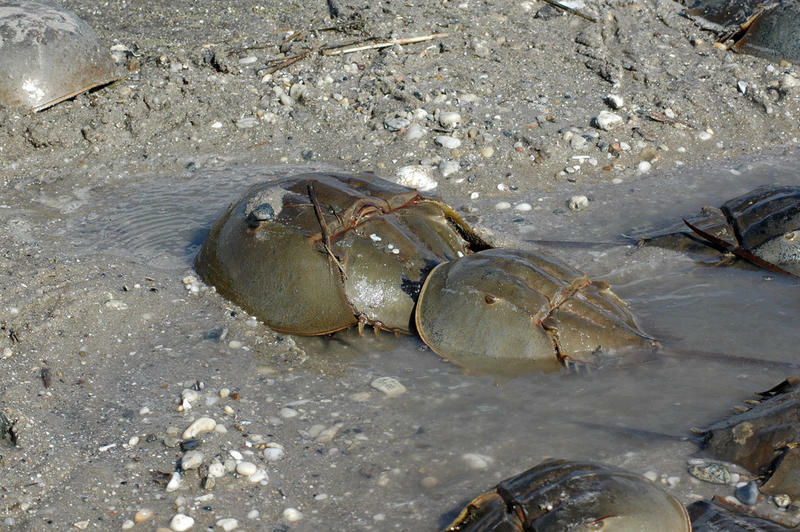 These days, more than a half-million horseshoe crabs are harvested annually for their blood, which has properties that help scientists identify bacterial contamination in humans. Unfortunately, this large scale use of horseshoe crab blood for medical purposes has substantially reduced their population. Although not yet on the endangered species list, horseshoe crab populations are under study to determine whether they need to be protected. Neither Ralph, I nor the woman who first noticed the large dome-shaped creature sidling quietly through the shallow water wished the slow-moving arthropod any harm. We were all just happy to have had a chance to encounter yet another of nature’s fascinating creatures. One can only hope that a saltwater inhabitant who has managed to survive for more than 450 million years can hang in there for millennia to come.